A smaller show sold to a firm trade. Patrick Fox £990/490kg, Darren Cush £940/440kg, £885/440kg, £850/440kg, £780/450kg, Alan Coyle £870/370kg, £840/380kg, £760/360kg, £700/310kg, Patrick Fox £815/400kg, Desmond and Ita Murphy £745/350kg,S Moore £690/280kg, £670/270kg and Adrian McAleer £685/290kg. 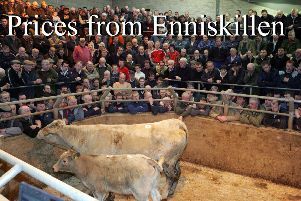 McGurk Brothers £945/440kg, £940/420kg, £915/420kg, M Miller £920/400kg, £890/410kg, S McNelis £730/360kg and Desmond and Ita Murphy £635/310kg.